This white paper provides a framework for understanding and aligning the variables at play, and guides you through workflows for three different multi-site approaches: time-shifted video, realtime broadcast and bi-directional, interactive experiences. The use of HD video streaming technologies is a growing trend that can connect multiple campuses together, under a shared worship experience. 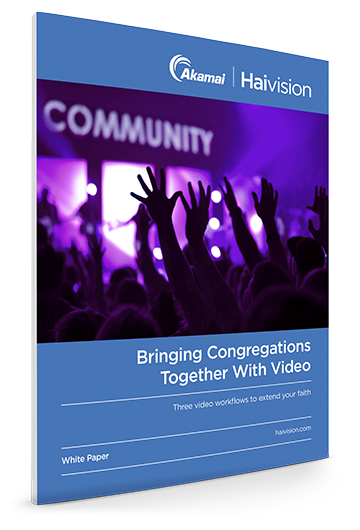 With more than 5,000 multi-site churches in North America, many ministries have found the right video solution that creates that unique experience, tailored to their community. The bottom line is that while video is the backbone of this experience, the most important goal is sharing your message with the world.